Poor Arnold Schoenberg. In spite of being a pivotal twentieth century composer his music just doesn't get performed that much. His early music represented the glorious excesses of late nineteenth century über-romantisch extremes. His later twelve-tone theories and his music fueled the imaginations of the post-war avant-garde. Some people, including Arnold himself, predicted that he would become one of history's great composers. Ticket-buying concert audiences, many of whom prefer their limited repertoire repeated endlessly, have never found Schoenberg's music that interesting. They, for better or worse, are the ultimate judges of who becomes a great composer. Perhaps audiences don't have the necessary familiarity with the history or theory of music to comprehend the importance of Schoenberg's music. And there's no question that Schoenberg is definitely important. The problem is that a lot of people don't find his music that interesting. A good place to learn why important things are interesting is in academia. That's where professors explain Schoenberg in the context of music history. They can teach you why he believed that his radical twelve-tone composition theory was both necessary and inevitable. And they teach how later composers, ones who don't get performed much these days either, mutated those ideas into even less comprehensible theories and structures. Once you know all that, maybe you'll find Schoenberg's music more interesting. But first listen to this fun mash-up for two pianos by Kyo Yoshida. Music by Arnold Schoenberg and by George Gershwin combined together into one piece. The two composers were friends here in Southern California. 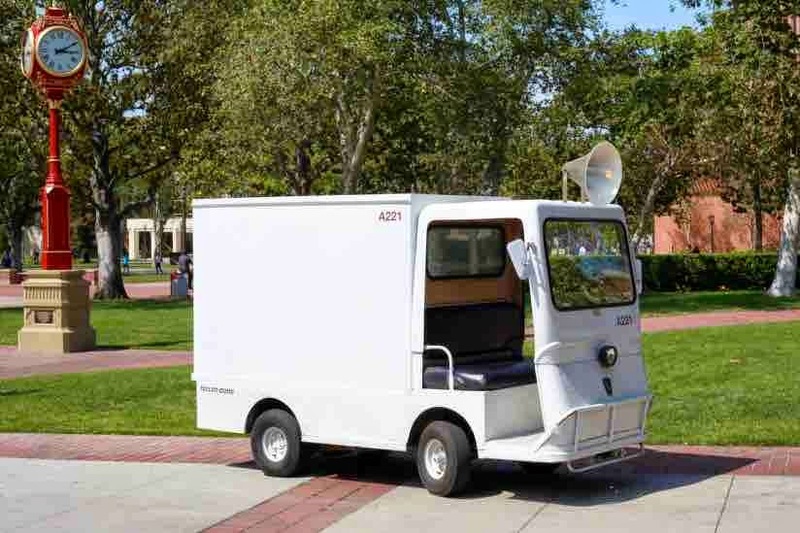 Last week, in an effort to drive up interest in Schoenberg's works, the University of Southern California, home of the most important music school on the Pacific Rim, decided to broadcast his music in a novel manner, by playing bits of it on loud speakers mounted on small electric trucks which roam the bucolic campus. The intent, I suppose, was to attract the attention of some eager young college students. Maybe hearing a bit of Schoenberg would make them curious enough to attend a concert/lecture. There they might learn why Schoenberg is both important and interesting. How could any project which promotes dissonance and asymmetry not be a huge success? Here's the USC picture of one of the trucks. Here's my picture of the same truck, A221. Live event and recital at Ramo Recital Hall, March 7th, 7pm. Don't laugh. A scheme like this just might work. When ice cream trucks give you stuff that's good for you, important stuff like German expressionism, instead of fun fattening stuff, like say actual ice cream, they aren't as welcome. 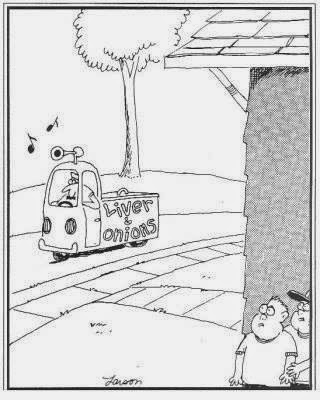 This Far Side cartoon, posted on Facebook by Joshua Creek, drives the point home. My friend composer Carlos Rodriguez even invented a word to describe the Schoenberg Soundways event: AUTOnality. I think that's funny. Would Mel Brooks get the joke? Christian Hertzog shared a video of an early Steve Martin television special. Here Steve's working with a string quartet which performs music by Bartok, Schoenberg's contemporary. Since our friends the paying concert audience actually like Bartok's music, Bartok is well on his way to being regarded as a truly great composer. Steve Martin does his best to make this bit funny. Mel Brooks would have been funnier. I decided to visit the campus during this autonal event. I wanted to witness it for myself. So, last Thursday, before meeting Leslie who works nearby, I spent an hour and a half searching the USC campus for Schoenberg in the wild. The USC campus is a big busy place filled with students coming and going or just hanging out. The most common modes of transportation seem to be skateboards and bicycles. There were also many little white electric vehicles of various designs. It took a while to locate any of the five special Schoenberg trucks. I found only two. They were number two labeled "Gurrelieder" and number three labeled "Erwartung". These two trucks passed me four times. I recorded each drive-by on video. Then I edited these videos into a single 2-minute YouTube upload. Please note that I have not altered the audio levels. The moment when the Erwartung truck driver honks at a bicyclist is the loudest sound I heard these trucks make. Sometimes the sound seemed to be turned off completely. I was only a few feet away. Notice how interested in the music the students seem. You probably want to ask "David, why do even you care about this?" Good question. On one level it's just a silly art project. Or maybe it's a badly executed on-campus concert marketing stunt. It's certainly not doing Schoenberg's legacy any favors. I do find the idea of playing music on mobil vehicles very interesting. Not important, just interesting. Doing this on a college campus has a lot of potential, in my opinion. Done well, a project like this would blend musical sounds with environmental sounds. Music from multiple trucks would also combine in unexpected ways. I like that sort of thing; I'm the kind of person who sometimes listens to multiple pieces of music simultaneously. A proper presentation on a large college campus would require many more vehicles. You could even mount small loudspeakers on bikes and skateboards and synchronize them all with some sort of wi-fi. You would turn up the volume if you really wanted to attract any attention. It might be better to have music specially composed for this situation. 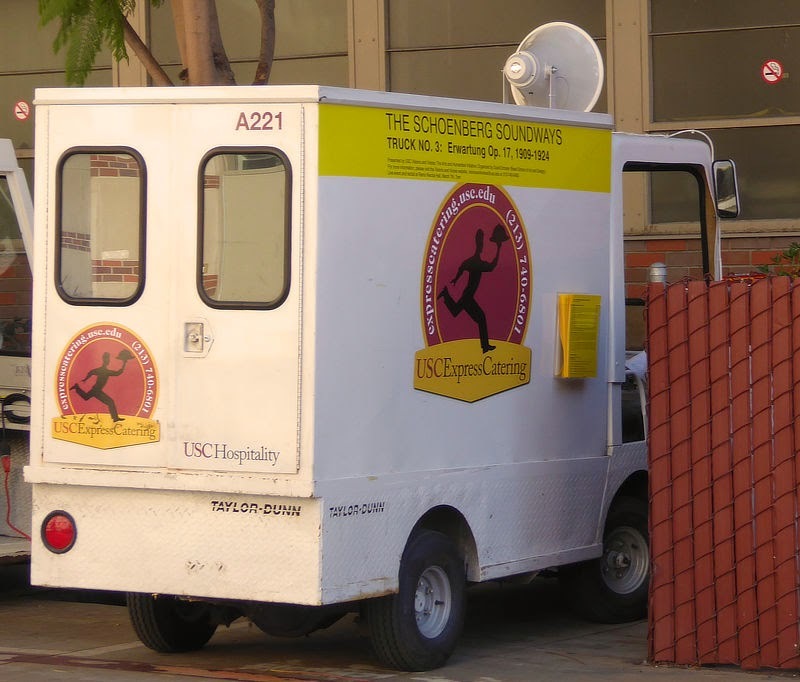 I wonder if there is a student composer at USC right now who would risk jeopardizing their future career by composing for ice cream trucks? If you insist on using already existing music Schoenberg is clearly not your man. Still, an important big-name composer would give a project like this much more visibility. Someone suggested Karlheinz Stockhausen because he's the guy who wrote a string quartet where each player travels in their own helicopter. I suspect that if Karlheinz were a USC professor he'd jump at the chance to write a new piece for five ice cream trucks. Or 500. Karlheinz Stockhausen is definitely an important composer even if he isn't around any more to write new pieces. Maybe a professor could present a lecture explaining why his music is also interesting. 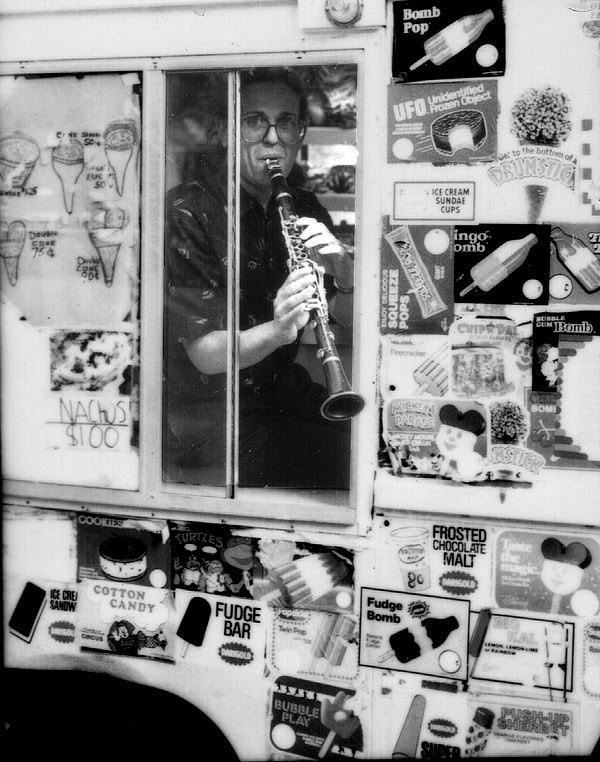 Here's a picture of me, years ago, playing the clarinet in an actual ice cream truck. This was taken by a photographer named Mike Bloom. Now it dawns on me! I must have written this entire article because I needed an excuse to publish this picture. 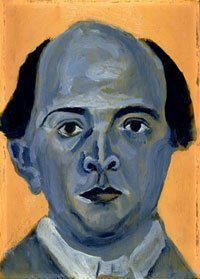 Check out the vast collection of Schoenberg self-portraits at the Arnold Schönberg Center. 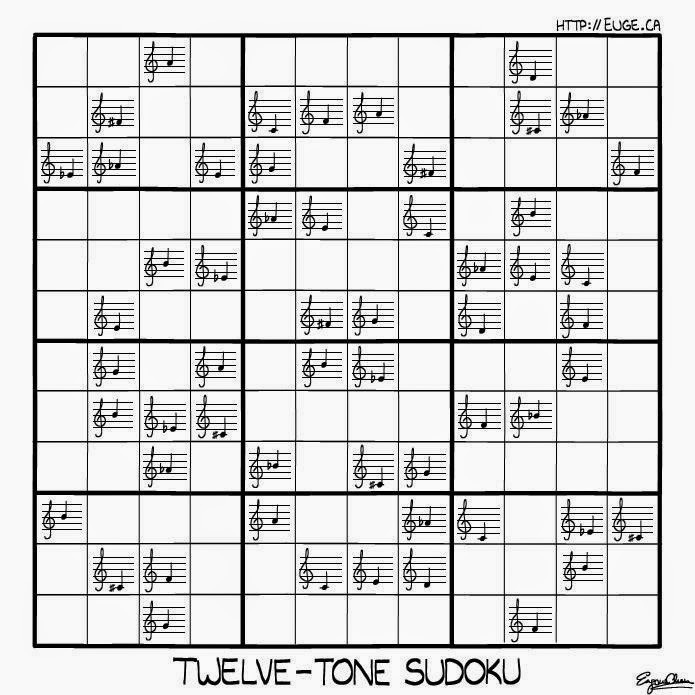 The twelve-tone sudoku puzzle apparently originated here. Mixed Meters posts about ice cream: Ice Cream Wishes (which is mostly about Yoko Ono), Che's Brand (only because it has a picture of an ice cream bar called Cherry Guevara), or Four 30 Second Spots in the form of a Horoscope (a very early post where each short piece of music is illustrated with a picture of disgusting ice cream). When writers ponder the reasons 12-tone Schoenberg isn't successful with audiences they offer endless variations of "they just aren't sophisticated enough to get it" --- essentially the same thing the traveling salesman told the emperor about his new clothes. They consistently miss the simplest explanation... the possibility that the music is indeed poor. Even if we admit the scheme may have potential, what are the chances that the first person to try it is going to be great at it? It's rare in human endeavors. He's not the first person to think he had invented "the music of the future" and not the first to be wrong about it. Yeah, Picasso and Braque really messed up when they tried that Cubism thing. But then, they were the first to try it.